Join the discussion on our forums! Come discuss Flobbidinous Floop over in our dedicated Flobbidinous Floop discussion topic. While in your hand, this is a 3/4 copy of the last minion you played. Of all the scientists, he has the most knowledge (when measured in volume). Golems are a girl's best friend! should this trigger Spectral Cutlass? Hey guys random thing I found out not sure if its glitched. When you play Dream Pedal Florist it can reduce the cost of Floop untill you play another minion then Floop returns to 4 mana. Has anyone else had this problem?? Not a glitch. As of Boomsday, if a minion transforms in your hand (Floop, Zerus, Chameleos), it doesn't keep any enchantments from its previous form. Just got this beauty! Golden! Shot my glorious gloop all over when i saw it! This is my favorite card just because I like saying it out loud. Taunt Druid can use him to get another Hadronox, if not running Oaken Summons. A Mecha'thun Druid could also run Floop as a low-costing way to trigger the deathrattle, allowing a combo without Galvanizer and Naturalize to dodge Skulking Geist. You phrased your question wrong. The question should be "should I craft Maylgos cuz I have Floop"
should i dust them all? Wait a week or two, and if Morrigan and the warlock quest doesn't miraculously become good, dust them. They are both bad cards, barring some crazy meta shift or unseen synergy. Boomship and Rin are both good in specific archetypes. If you have a good druid collection, maly druid is extrememly good. should i dust tess greymane, lilian voss and scourgelord garrosh? if you are sure you won't buy *any* boomsday packs anymore, then and only then i would dust any boomsday legends at all. otherwise you risk getting morrigan again. you wouldn't be the first. warlock quest (from un goro) is not good. the boomsday warlock legendary is insane and possibly the best legend in boomsday. tess is not competitive right now, I would not really dust her neither unless you're desperate. lilian voss is dust material. garrosh was good until dr boom showed up. he's still ok, though. but if you are again desparate ... he might be a candidate. 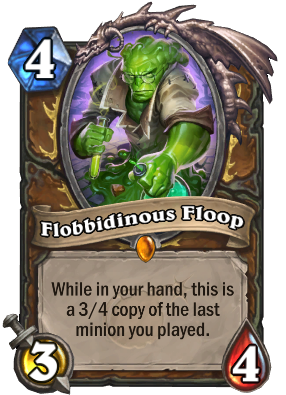 When you lose due to this guy doing something busted, just say "I really got Flooped on that one!"